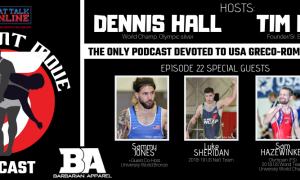 2016 Olympian Jesse Thielke (63 kg, NYAC) rebounded in style Thursday morning with a pair of big wins while two of yesterday’s semifinalists, Brandon Mueller (72 kg, 505 Wrestling Club) and Chris Gonzalez (77 kg, NYAC), stuck to their guns in effort to put themselves in position for a medal. However, the biggest story of today’s consolation round thus far at the 2017 Dave Schultz Memorial International might belong to National Team member Jon Anderson (87 kg, Army/WCAP), who turned it on and then some to come away with a message-sending tech fall over 2016 National runner-up Khymba Johnson (NYAC/OTS). 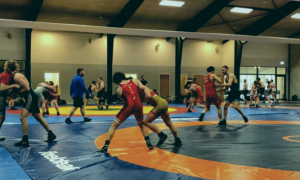 Wrestling began at 10:00 (Mountain Time) at the Olympic Training Center in Colorado Springs and aired live nationally on Flowrestling. Anderson, who just turned 33 in September, emptied the tank in his quarterfinal loss to eventual finalist Giorgi Tsirekidze (GEO) yesterday but bounced back with tech’s against Kim June-Hyeong (KOR) and Easton Hargrave (CWC) to set up his bout in the consolation semis opposite Johnson this afternoon. The action was tight and physical throughout the first period with the pair trading passivity points. Johnson seemed to be doing an admirable job clawing for two-on-ones and short snaps as the second period unfolded, which was important given Anderson’s well-known workrate. There weren’t a ton of openings for either wrestler despite numerous spirited exchanges, but that all changed in a hurry. With :90 left in the bout, Anderson zipped in on a bodylock and hustled Johnson off the edge for a point. When they reset, Anderson was back at it again, this time by taking advantage of a high front headlock attempt by Johnson. The WCAP rep ducked right into a bodylock he hurled over for a correct throw. Anderson kept the lock and scored four more off of a straddle lift to make the score 8-1. They reset just in time for Anderson to coerce Johnson out again to seal it all up with via tech, his third such victory of the tournament. In the consolation finals, Anderson will square off against Korea’s Park Jae-Woo, who defeated two-time World Team member Cheney Haight (NYAC) via fall earlier. The comebacking Thielke dropped a tough match to Mostafa Hassan (EGY) in the 63 kilogram quarterfinals yesterday which deposited him into the consolation bracket where he made quick work of multi-time age-group All American Tyler Cunningham (MWC). Standing across from him this morning was Marine Xavier Johnson, a still-raw but gifted athlete who last year competed down at 59 kilos. Thielke found little trouble with Johnson, jetting out to a 6-0 first-period lead before wrapping up a 10-2 tech fall in the second. To clinch his spot in the bronze medal match, Thielke had himself a potentially very tough test in fellow Rio Olympian and 2012 Asian Championships winner Lee Jung-Baek. Maybe it was the quality of opponent, maybe the two-day format is agreeing with him — whatever the case may be, Thielke was demonstrating a different level of energy. Two came Thielke’s way off of a scramble and the bout looked like it was going to offer a frenetic pace for the entire six minutes. Except it didn’t last that long. Or even close. Following the proceeding reset, Lee jolted Thielke over with an arm throw that netted him two. But Thielke had not only come loose on the maneuver, he also had leverage and used it instantaneously by turning right into Lee, who was already in bad position. The Wisconsin native simply planted himself right on top to collect the fall at :58 into the bout. For bronze, Thielke will be facing off with 2014 University bronze medalist Sam Jones (NYAC/OTS). Jones has medaled on three occasions at this event, including a silver back in February’s tournament. 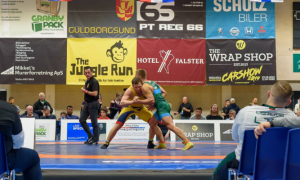 Regardless of Mueller’s relative youth in the sport of Greco-Roman, his performances over the past nine months suggested placing at this tournament was an expectation. And as of press time, he is in position to do just that. A passivity-filled loss to 2016 Olympian Tomohiro Inoue (JPN) last night put Mueller in the consolation semis versus another Japanese wrestler today in Toshiki Mori. Mueller brought the pressure to begin and took a short arm drag to swoop around back for the first two points of the contest. The action was stop-start for most of the period but it was the American who controlled the tempo. With under a minute remaining, Mueller received a passivity point right before grabbing another two off of a failed Mori headlock attempt. Mueller maintained position on top, clamped around Mori, and proceeded to gut him over for two more and a 7-0 lead heading into the second, where he iced it on Mori’s second passivity knock. In the consolation final, Mueller has 2012 University World bronze medalist Jamel Johnson, who has looked extremely impressive in his own right with runaway wins over Marine teammate Josh Russo and Robert Zyko (Army). Out of every bronze medal match on the schedule, this one promises to be one of the most entertaining. Following last night’s crazy back-and-forth loss to 77 kilogram finalist RaVaughn Perkins (NYAC), Gonzalez got back on the winning track against a game Anton Kalista (CMPWC). The Illinois product Gonzalez owned a 1-0 edge in the first until Kalista unfurled a nifty four-point arm throw. Gonzalez was awarded a point, as well, and then he snuffed out a Kalista headlock try at the edge to knot the score, although Kalista still held criteria. A minute into the second period is when Gonzalez struck again by getting around Kalista for takedown. He next looked to heave a reverse gutwrench; Kalista landed on top as the two went out of the circle, but the whistle had already blown. Kalista challenged and lost, giving Gonazalez a point and a three point margin for error he would not relinquish. Gonzalez’s opponent for bronze is 2017 Junior Pan-Am Championships gold medalist John Yeats (CAN). Yeats and Gonzalez also met in the quarterfinals with Gonzalez prevailing on criteria.